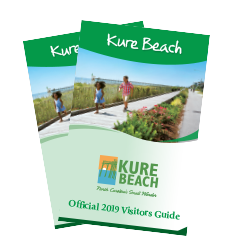 You’re just a hop, skip and a jump away from a vacation to Kure Beach by requesting the Official Visitors Guide. With detailed information on accommodations, attractions, dining, and outdoor activities, this guide is your ticket to successfully planning a Kure Beach vacation or getaway. Inside you’ll find highlights on the variety of things to see and do here, and ways to unplug and reconnect with family and friends. Click here to view the digital Visitors Guide where you can print or save it as a pdf. If you would like to learn more about special deals, seasonal events and things to do, sign up to receive Kure Beach eSpecials delivered right to your inbox.